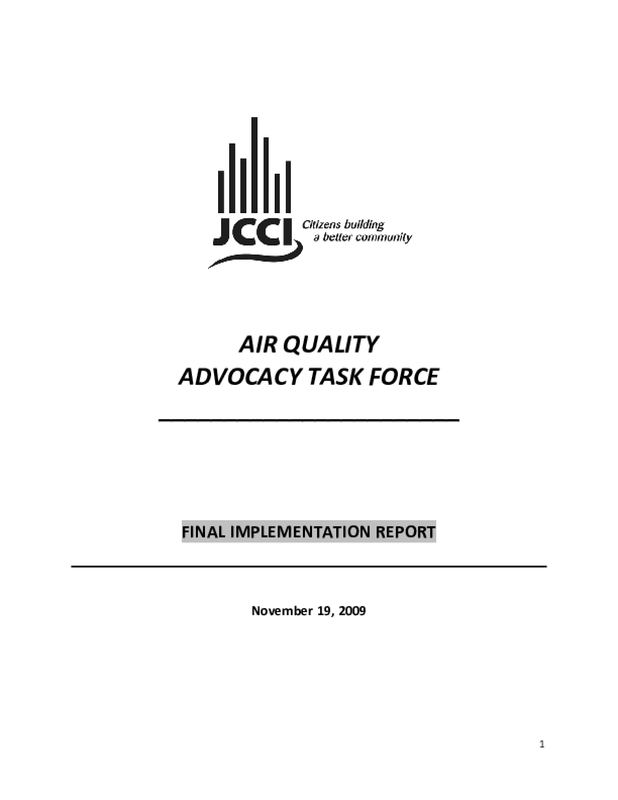 JCCI's Air Quality study, chaired by A. Quinton White, Jr., was conducted over an eight‐month period and released to the community in June, 2007. While recognizing the progress Jacksonville has made in overcoming significant air pollution and odor problems that oncemade it the brunt of national jokes, the study concluded that a proactive approach to Jacksonville's air quality future is still imperative. With an anticipated doubling in the city's population by 2030 and the predictable attendant air pollution from increased energyproduction and vehicle emissions, it is clear that without a community‐wide effort to effectively deal with these problems, the quality of life, natural environment, and economy of Northeast Florida will be severely compromised. With that as a backdrop, the Air Quality Advocacy Task Force, under the leadership of Donald D. Anderson, began its work in July, 2007. A group of 34 individuals attended an orientation meeting and were involved at various stages of the two‐year project, and 25 participated from beginning to end. The Task Force was divided into four subcommittees with each assuming responsibility for a minimum of three of the study's 14 recommendations. The full Task Forcemet quarterly, and the subcommittees met separately on numerous occasions, including many individual meetings with a wide range of stakeholders, elected officials, and prominent civic leaders throughout Northeast Florida. Complicating the challenges of the Task Force was the worldwide economic downturn which sharply curtailed funding opportunities for various projects contemplated in the recommendations. Nonetheless, this final implementation report presents a positive picture of success, with seven of the recommendations being fully implemented, five partially implemented, and only two notimplemented at all. As is frequently the case with JCCI implementation projects, however, perhaps the most important contribution of the Task Force is the degree to which it elevated the awareness level throughout the community of issues related to environmental sustainability. This served as a catalyst for many positive developments that ensued over the two‐year time span. While the Advocacy Task Force certainly does not claim direct responsibility for all of the achievements that helped address the recommendations, we are confident that our efforts were instrumental in bringing greater focus to these issues which helped to influence favorable outcomes. When the Air Quality Study was initiated in 2007, many now‐familiar terms or phrases were either unfamiliar or largely ignored in the Jacksonville community, such as: "LEED" green building standards; "CFL's"; "Sustainability Officers"; "Energy Star" appliances; "bio‐fuels andbiomass"; and many other examples. Two years later, these have become so much a part of common lexicon that it seems they've always been part of Jacksonville's culture. This is perhaps the most important and lasting legacy of the Air Quality project, and the dedicated members of the Advocacy Task Force, while often conducting their work quietly and out of the public view, deserve significant credit for this transformation of the community's mindset. Copyright 2009 by Jacksonville Community Council, Inc.. All rights reserved.